Today in this post I will tell you when you will get your AdSense cheque in India. When I was going to get my 1st AdSense cheque I was too excited and also too worried/confused about how I will get my cheque, when I will get and many such questions where coming in my mind. Even I should be because it was my 1st income ;D. And for my 1st income I really want to thank to my family, my mom, my cute little niece (sister’s daughter) and also really-really want to thank to one more person (sorry, I can’t tell the name). 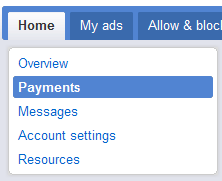 Anyways coming to the point if you are also going to get your 1st cheque from AdSense, here how you will get to know when and how you are going to get your cheque. Note: BLUE DART update your number before 2-3 days from the date you will get deliver. And you will generally get deliver in 10 days from the date of cheque issued.